The Created Page: Summer Of Creative Chemistry - Week 1 Challenge. I am new to the world of blogging so I decided to dive in and make a start and hopefully learn a few things along the way. I love taking papercraft supplies and combining them with textiles to come up with some interesting textural art that usually end up as pages for my fabric books. 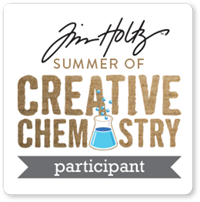 Tim Holtz Summer Of Creative Chemistry. Here is my submission for the week one challenge. I have used fabric, fibres, seam binding and beads. I used the Blended Spritz and Flick technique to achieve the bubbles in the watery background. I also used the Wrinkle-Free Distress technique to colour my fish, reeds and net. This will eventually become a page in a fabric book I plan to create to contain all my challenge submissions. I think it will serve as a great technique resource book for future projects.